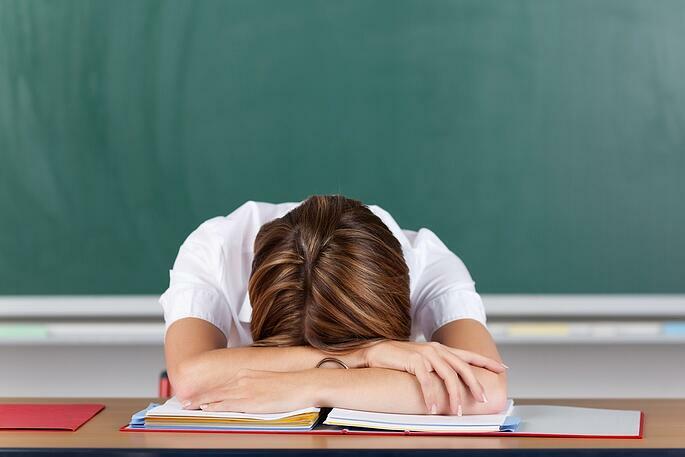 How Can Teachers Deal with Chronic Migraine? Teachers are as susceptible to migraine as anyone else, but having to go to school and face groups of rowdy children or teens when your head is splitting might not feel very normal. For migraine sufferers, the school week often starts with the tired, heavy feeling that signifies a headache is on the way. By break time, migraine aura is in full swing and the pain is starting to announce its arrival like a hot poker behind your eyes. If this is a common occurence, here are some methods you can try to deal with your chronic migraine in a classroom environment. Knowing your migraine triggers is the first step towards avoiding them, so keeping a diary is vital to determine what sets you off. Do flickering classroom lights feel like they are piercing your brain? Light filters could be the solution. You can order Pete the Cat flame-retardant light filters from Amazon, which get a good rap for blocking out the worst of the glare. If you use a computer or laptop regularly, add a screen filter to reduce the glare from that too. If your classroom gets lots of sun and natural light, wearing tinted glasses might help you manage. Stress is a common migraine trigger, so look for ways to minimize it during the workday. Plan your schedule in advance and stick to it, handling one task at time instead of juggling many balls in the air. Do scents and odors get you going? Put up a notice for your students not to wear perfumes and body sprays in your class, or ask those wearing them to sit as far back as possible. This is common practice in public spaces these days, so if you explain why you can’t handle it, chances are your class will respect your request. Keep a small fan on your desk and experiment with air flow, to determine the best direction for blowing scents away from you. Avoid using markers and art supplies with strong scents or odors, too—this is for everyone’s benefit, not just yours. Avoid dehydration. Hot classrooms in summer and overly-heated rooms in winter are surefire ways to set off a migraine attack. Keep a bottle of cool water on your desk and sip frequently. A small, damp towel or fresh wipes will help cool your face and neck, too. Keep snacks handy to nibble on, if hunger is one of your triggers. A nut bar or some glucose drops will last well in your drawer or purse, and they are easy to eat even if the headache has already begun. Keep your classroom as dust-free as possible, if allergies are your trigger for you. Even if you have to sweep it daily yourself, it might be worth it for you. Getting a good night’s sleep at every possible opportunity can help prepare you for school days. Check the quality of your sleep, and make sure you rest well on weekends ahead of the new week. If it’s possible, try scheduling downtime to take a quick nap somewhere quiet during break-times. This could even mean resting in your car while parked in a safe, undisturbed spot. Find a secure place to keep a supply of non-drowsy medications. If your migraine attacks come on suddenly, you need to have preventive migraine medicines close at hand. This can be complicated, especially since you might not want to keep strong opiates in your purse. Many over-the-counter medications can help stave off the headache, at least for a while. If you have a locker in the staff room at school, put your medications in an unidentified container like a toffee tin, and keep them stashed away for emergency use. It’s important not to let word spread that you have medical products on the premises, in case it encourages theft. Only you will know how news of your migraine attacks might be received by the school’s administration. In some instances, coming out can be a blessing that generates all the support you need. In others, it can open the door for discriminatory treatment. Disclosure is more likely to be a positive experience if you accompany the news with a doctor’s note confirming your condition. If you tell a few trusted colleagues about the problem, though, it will make it easier for you on days when you need support. Knowing the truth can also reduce the risk of resentment or being judged incompetent when headaches get the better of you. Chronic migraine sufferers in the teaching world know how difficult it is to keep up appearances in the face of frequent headaches. The truth is, however, you have to find ways to do so in order to keep doing the work you love.